This Background Vocalist has performed as a background vocalist on over 50 recordings released between 1997 and 2011. In any given year she may appear on anywhere from one to ten releases, and she does roughly equal parts work on independent releases and major label releases. The independent work contract structure is typically a buyout, where she is paid a flat fee for her time and expertise. For recording sessions that are made for signatory companies (usually larger record labels who have a standardized negotiated rates through SAG-AFTRA) she gets paid through SAG-AFTRA. In addition to earning flat fees for her work as a background vocalist in the studio, the Background Vocalist’s union performances on successful sound recordings can generate mailbox money. Fees for session musician work done in the studio make up the majority of this Background Vocalist’s recording-related income in 2009 and 2010. 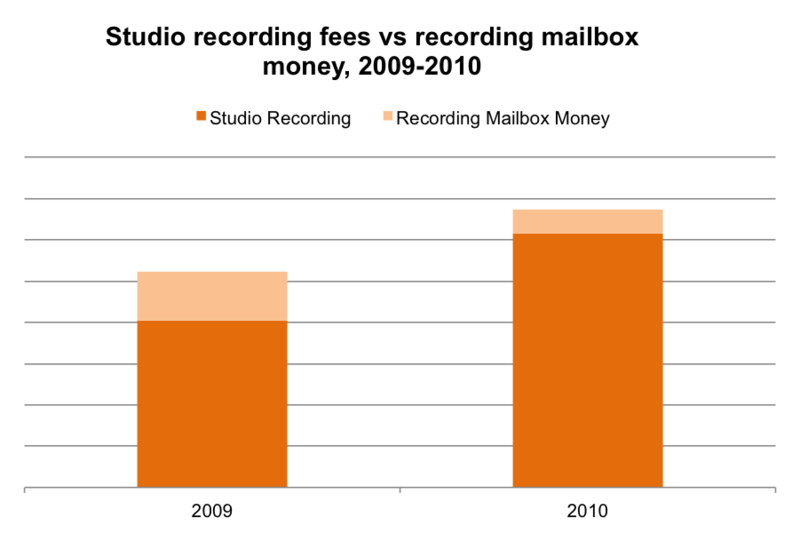 The remaining recording-related income comes from mailbox money. While this singer earns 77% of her income from her initial studio recording fees in 2009 and 91% in 2010, she still makes small sums of money from recording mailbox money every year. In fact, some of the mailbox money included within her earnings for these two years is from releases as far back as 1998. This income provides a valuable additional revenue source that can grow as recorded music is made available on new platforms and services, everything from Spotify, to Pandora, to iTunes Radio. Just as TV/film mailbox money is money earned after the (flat fee) initial performance for additional uses of a film or television performance, a session musician earns a flat fee for a studio recording and then receives royalties from the AFM & SAG-AFTRA Fund flowing from copyright law for additional uses of the works on which they’ve appeared. These funds are from a variety of foreign and domestic sources, including 5% from non-interactive webcast radio services like Pandora or Sirius XM. In addition, SAG-AFTRA requires payments to background musicians when sound recordings are used in new mediums, such as TV or film, or when they sell over certain sales plateaus. For a complete list, visit http://www.raroyalties.org.